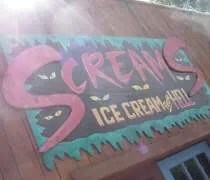 Screams Ice Cream From Hell on Patterson Lake Road in Hell, Michigan. Our trip to Hell had to include some sort of souvenir….and if we could get some ice cream while we were at it, why not? The original plan when we left Lansing was to stop at the Hell Country Store because I knew they had some sort of collectible that we could add to our shelf as a memento of our visit to Hell, but when we got there, we found the store closed. As we were eating lunch, we overheard a waitress telling another couple that the ice cream store had souvenirs. Screams Ice Cream From Hell is one of three businesses along Patterson Lake Road in an unicorporated part of Livingston County known as Hell. The building has multiple uses. It’s an ice cream shop. 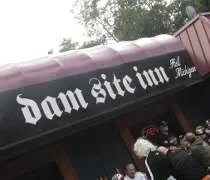 It’s a souvenir stand and it’s a putt-putt golf course.